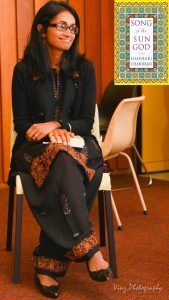 I was recently invited to speak on a panel at the South Asian Festival of Arts and Literature in Sydney. The topic was South Asian Writing in Australia. It was wonderful to be featured with talented, committed writers, playwrights and academics like Roanna Gonslaves (author of Permanent Resident), Adib Khan, Sharon Rundle and Champa Buddhipala. There was talk about cultural appropriation. The documentary maker, Ana Tiwary, noted that Australia is multicultural and its stories are multicultural. The audience and readers want those stories. They are fascinated by those stories. But between the artists and the audience, there are the funders/producers/publishers. They are monocultural. These stories don’t resonate with them, and they don’t think these stories will be of interest or will sell. These people in the middle create a barrier (largely because of what they will or will not fund). This is a systemic problem and challenge for the kind of art that makes it into the public space. The festival gave me a lot to think about. It also reminded me that people do incredible, creative things. It takes courage and support. I felt really welcomed and supported by this artistic community. Here’s a photo from that day. Thank you to Simran Dalia at Vinz Photography.